couples and families with children of all ages. Surrounded by olive trees, nestled in the rolling hills of Salento, the Masseria Salinola is in the province of Brindisi, between the Valle d'Itria and the Alto Salento. Within walking distance is the crystal-clear sea, of incomparable beauty. The airport of Brindisi is about 30 minutes, the airport of Bari about 1 hour by car. Charming suggests you to rent a car to reach your desired Masseria. An old salt warehouse dating back to 1700, surrounded by seven acres of land for productive activities (organic) farm, is the charming setting that gave rise to the Masseria Salinola. The traditional character of the structure, such as lime and white stone interior, were carefully preserved, giving rise to the very charming rustic style spaces that recall the ancient and alluring atmospheres. 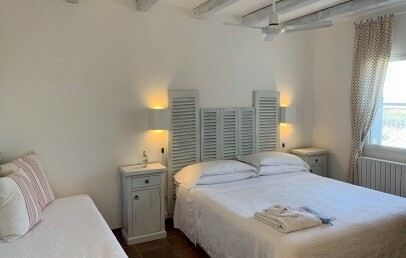 The rooms of Masseria Salinola are divided between Classic, Superior and different Suites with varied sizes from each other (being derived from an old building). They have beautiful stone walls and ancient "chianche" to cover, are made of humble materials that create a beautiful decorative effect as lime, water colors and “opus signinum” ("coccio pesto" a traditional material similar to earthenware). Classic, Superior and Junior Suite have a double bed and bathroom with shower. Suites have double beds (one of them can accommodate a third and fourth bed), a shower and a private entrance. The suites have a Turkish bath, for the exclusive use of the room guests, to offer them pleasant moments of relaxation after a busy day. Suite Aranceto (Family Superior) is perfect for families with children and it’s located on the ground floor. It consists of two rooms, a bedroom with canopy bed and a living room with "alcove" with two sofa beds (possibility of 3rd and 4th bed), bathroom with shower, elegant and simple furnishings, with every comfort. Individual entrance and equipped veranda. 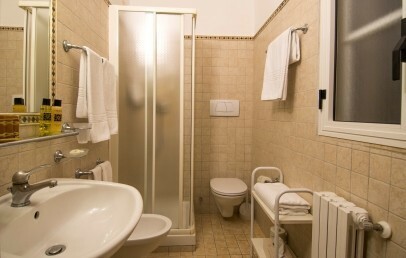 Suite della Chiesa (Family Superior) is intimate and elegant and can accommodate up to 4 people, also ideal for families. The living room has a fireplace and a small corner equipped with a small cooking plate and a sink. 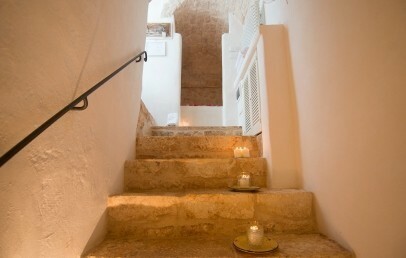 From the courtyard of the Masseria is an individual entrance and it has a furnished, private veranda. 2-room Apartment ideal for families. Consists of a bedroom with a double bed in wrought iron and a single bed, bathroom with shower, a living room with a sofa bed and kitchenette (not present in all apartments). They have antique and rustic furniture and an equipped veranda / balcony with a private entrance from the courtyard of the Masseria. The Masseria Salinola does not have a spa, but offers several spaces where guests can relax: the outdoor pool (8m x 15m) with a neck massage, a beautifuloutdoor Jacuzzi for 8 people, a solarium. The Suites have a private Turkish bath in the room. Nearby, you can practice several sports: riding, golf, tennis, cycle trekking, snorkeling and bird watching. At the restaurant you can taste the best cuisine of Puglia with the popular extra virgin olive oil and other products from the Masseria. The specialty is "orecchiette" with broccoli rabe (traditional regional dish), mashed beans cooked in "pignata" and the rabbit cooked in the oven. Completing the meal, the delicious "Rosoli" of the Masseria Salinola, digestive made of herbs, fruit and berry products from the fields of property and those in the immediate nearby. IMPORTANT – The half board service is guaranteed from April 1st to November 1st, while during the other periods the restaurant will open occasionally. From December, 24th to January, 6th the service may be reserved. Please contact our staff for further information. The farm offers various possibilities for entertainment, that help in get in contact with nature and with local traditions. Guests have the possibility to do a bike ride through the olive groves, to savor the local delicacies with oil and wine tastings, to make fascinating excursions in the surrounding area. Those who want to relax, can sit with a good book in the terrace or in the gazebo, or even in the reading room, in the TV room or in the fireplace room. Other services offered by the Masseria Salinola are: outdoor swimming pool, table tennis, rural church dating back to 1700, private parking, free Wi-Fi, olive picking, cooking courses and sale of agricultural products. The rooms are furnished in traditional style: stone walls and simple materials such as lime, water colours and “opus signinum” (cocciopesto). The bathroom has the shower; all rooms have a private entrance. The price includes free Wi-Fi, coffee and tea facilities, beach umbrella. 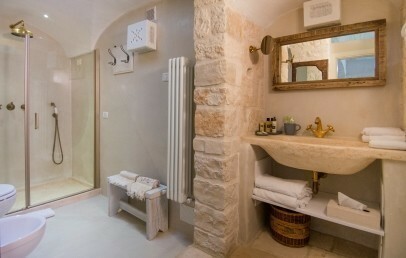 The Suites are furnished in traditionale style : stone walls and simple materials such as lime, water colors and “opus signinum” (cocciopesto). The bathroom has the shower. 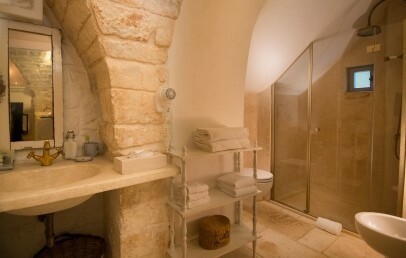 The Suites have a private entrance and a Turkish bath for the exclusive use of room guests. The price includes free Wi-Fi, coffee and tea facilities, beach umbrella, mountain bike at disposal and a private parking. 2-rooms Apartment ideal for families. Consists of a bedroom with a double bed in wrought iron and a single bed, bathroom with shower, a living room with a sofa bed and kitchenette (not present in all apartments). 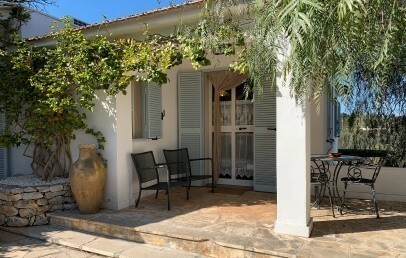 They have antique and rustic furniture and an equipped veranda / balcony with a private entrance from the courtyard of the Masseria. 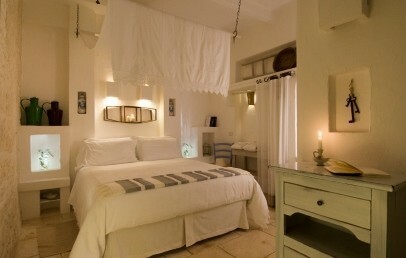 The dominant color in the Superior rooms is white and each has its own history and its own individual charm. 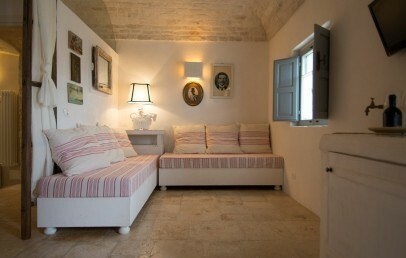 They are furnished with restored objects of peasant life of the old farmhouse Masseria. 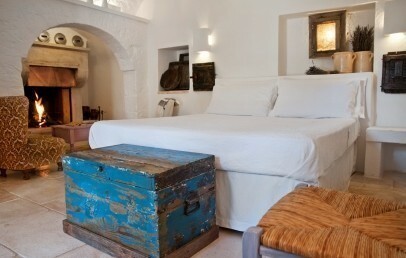 Comfortable and sober elegance decorated accommodation with an intimate and charming atmosphere. It can accommodate up to 4 people and it is perfect for families. It is located on the ground floor, where originally was the old barn and has a separate entrance from the courtyard of the Masseria. 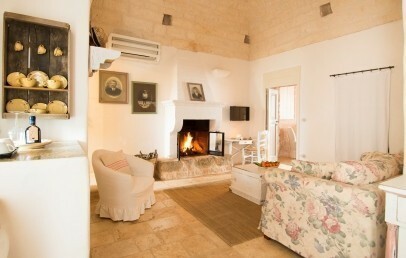 The decor is embellished with objects of peasant life of the old typical Masseria and combined with modern amenities such as LCD TV, internet connection Wi-Fi and air condition. This accommodation has either two separate rooms or a day and night zone. The bathroom has a shower, hairdryer and complimentary toiletries. It has an individual entrance and an equipped veranda. The dominant color in the Junior Suites is white and each has its own history and its own individual charm. 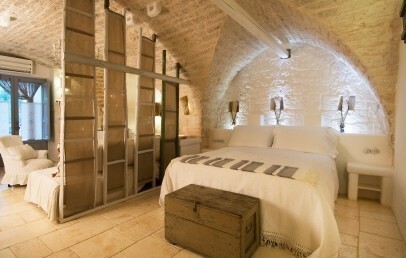 They are furnished with restored objects of peasant life of the old farmhouse Masseria. Use of the kitchenette (optional): € 15,00 per day. Baby cot (optional/€ 10,00 per day) to be requested upon confirmation and paid on site. Baby Package (baby cot, breakfast and 1-course dinner): € 30,00 per day, to be requested upon confirmation and paid on site. The meals for the baby (0-2 y.o.) are to be paid on spot, à la carte. Half Board on request: € 45,00 per night from 13 y.o. 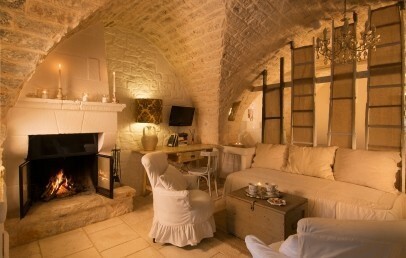 ; € 30,00 per night from 3 to 12 y.o.